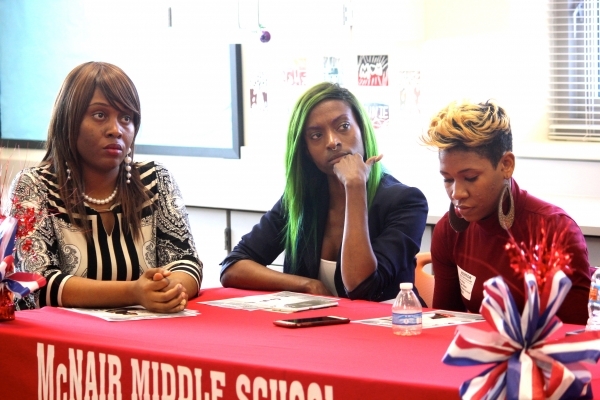 Ni’cola Mitchell panelist on “We Speak” campaign at McNair Middle School | WHY Jonell PR? Ni’cola was tapped on the corner to be part of an amazing panel group of women gathered together at McNamara Middle School to discuss domestic violence with a classroom of 8th grade girls. The girls were very attentive. It’s easier to press forward and pretend the abuse is not taking place, then to stop and deal with issues at hand. Remember the abuser has no excuse to leave you alone unless he/she understand you mean business. To read more check out Nicola’s latest article in Rolling Out Magazine. When she isn’t writing, Mitchell loves to spend time with her family and volunteers as a mentor for youth activities. Originally from Kingston, Jamaica, she currently resides in North Las Vegas, Nevada with her two daughters Destani and Diamond. Ni’cola is also the CFO of Obsessive Soul Media and Co-Founder of the Baltimore Urban Book Festival. She sits on the board of the Miss Black Collegiate USA Scholarship Pageant, and manages the pageants Author Pavilion. She is also a primary panel member for the State of Black Parent Conference. Ni’cola is also the Celebrity Brand Ambassador for Premier Hair. She is a contributing writer for Urbania Magazine and FeedLynks, the Urban News Network. Ni’cola is a Strategic Partner for the California’s Women’s Conference, and is also a 2014 Blogger’s Week Ambassador. She holds a Bachelors degree of Science in Business Management and is currently pursuing a Master’s of Business.